It’s been a struggle for Malcom since his summer switch to Barcelona, but he’ll be hoping his goal against Inter in the Champions League this week could spark his stint into life. The 21-year-old arrived from Bordeaux this past summer and he would undoubtedly have hoped to feature more prominently than he has done at the Nou Camp thus far. 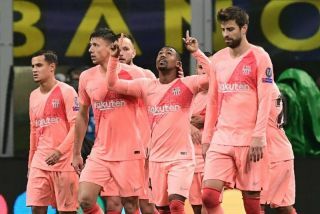 Malcom has been restricted to just four appearances in all competitions, totalling 114 minutes of football, but after scoring his first goal for the Catalan giants in their draw with Inter in midweek, it could give him the confidence and belief to kick on and earn more playing time from coach Ernesto Valverde. However, he has now opened up on what the Barcelona boss has told him that he must improve on in terms of his defensive work, while he has made no secret of the positive influence that his teammates are having on him in terms of keeping him patient and level-headed while thinking about the long-term at Barcelona. “The coach tells me that I must improve defensively, I have to improve,” he is quoted as saying by Mundo Deportivo. “The coach has his opinion and I must wait patiently. Given Lionel Messi has been sidelined through injury in recent weeks, that should arguably have given Malcom his best chance of featuring regularly. However, the Brazilian starlet will have to continue to fight with the likes of Ousmane Dembele, Philippe Coutinho and Messi for a place in the final third, but making a positive impact when given a chance like he did at Inter will certainly do his chances no harm.